What does it mean when someone says that they’ve been baptized by the Holy Spirit or baptized into the Holy Spirit? What does baptism of the Spirit mean? I had a friend come up to me after I was saved asking if I had been baptized into the Holy Spirit. I told him that I had received the Holy Spirit and then been baptized. He said you haven’t had the baptism of the Holy Spirit? Why not!? Good question, so I started to find out what this fellow meant driven in part by being made to feel inferior. I came to discover what the word baptism means. The Greek word for baptism is “baptizo” which means to be immersed under water. Baptizo is in the verb form which means a person was baptized (verb, it’s the action of being baptized). The noun form is “baptisma” which literally means washing and almost always has to do with water. I already knew about the Holy Spirit and that a person is regenerated or born again when one receives the Holy Spirit. When a person is saved, then they are to be baptized as commanded in the New Testament. But this “baptism of the Holy Spirit” was still a mystery to me. What could it mean? I hate to see Christians divide over the language of the New Testament when the Spirit should unite us instead. Is the baptism of the Holy Spirit and being baptized with the Holy Spirit the same thing? The term “baptize with the Holy Spirit” occurs in several places in the New Testament. Let’s read some of these to see if we can find the meaning of the term of being baptized with the Holy Spirit. John, when speaking about Jesus said, “I saw the Spirit come down from heaven as a dove and remain on him. And I myself did not know him, but the one who sent me to baptize with water told me, ‘The man on whom you see the Spirit come down and remain is the one who will baptize with the Holy Spirit” (John 1:32-33). Again, John said about Jesus, “I baptize you with water. But one who is more powerful than I will come, the straps of whose sandals I am not worthy to untie. He will baptize you with the Holy Spirit and fire” (Luke 3:16). Jesus instructed the disciples just before His Ascension to “not leave Jerusalem, but wait for the gift my Father promised, which you have heard me speak about. For John baptized with water, but in a few days you will be baptized with the Holy Spirit” (Acts 1:4-5). You can not be a believer and not be baptized by the Spirit. So there is One Spirit and that is the Holy Spirit and Paul is saying that all believers are baptized by the Spirit. You can not be a believer and not be baptized by the Spirit. If someone has not the Spirit of God, they are not the children of God because “those who are led by the Spirit of God are sons of God” (Romans 8:14) “And this is how we know that he lives in us: We know it by the Spirit he gave us” (1 John 3:24). The Holy Spirit makes us part of the Body of Christ. If we don’t have the Holy Spirit, we are none of His since “if anyone does not have the Spirit of Christ, he does not belong to Christ” (Romans 8:9). Indeed, “those who are led by the Spirit of God are the children of God” (Romans 8:14). Romans chapter 8 is almost all about the Holy Spirit. Paul wrote about being filled with the Spirit in Ephesians 5:18-19 which says, “Do not get drunk on wine, which leads to debauchery. Instead, be filled with the Spirit, speaking to one another with psalms, hymns, and songs from the Spirit. Sing and make music from your heart to the Lord.” It seems that being filled with the Spirit means being controlled by the Holy Spirit. We will have complete fulfillment if we allow the Holy Spirit to control us. To be filled with the Spirit is to be controlled by the Spirit for the Spirit’s presence is revealed in the fruit we produce (Galatians 5:22-23). Peter is a prime example of what it means to be filled with the Spirit in Acts 4:8 when he boldly addressed the Sanhedrin, which was like the Jewish supreme court, “Peter, filled with the Holy Spirit, said to them: “Rulers and elders of the people!” Peter was not alone in this as “Paul, then Saul, who was also called Paul, filled with the Holy Spirit, looked straight at Elymas and said, You are a child of the devil and an enemy of everything that is right! You are full of all kinds of deceit and trickery. Will you never stop perverting the right ways of the Lord? Now the hand of the Lord is against you. You are going to be blind, and for a time you will be unable to see the light of the sun” (Acts 13:9-11). Here is clear evidence that when a believer is filled with the Spirit, they are obedient to the will of God. Peter and Paul’s boldness in evangelism was due to their both being filled with the Spirit of God. But where did Paul receive this Spirit? In Acts 9:17, “Ananias went to the house and entered it. Placing his hands on Saul, he said, ‘Brother Saul, the Lord—Jesus, who appeared to you on the road as you were coming here—has sent me so that you may see again and be filled with the Holy Spirit.’” Here we see that being filled with the Spirit occurs at conversion, like with Saul (later named Paul) and being filled with the Spirit can also mean being bold in preaching the gospel or in being a witness of Christ. Being filled with the Spirit doesn’t seem to be tied with miracle gifts of healing, or tongues, or prophesying but in being controlled by Him. Being filled with the Spirit then happens when a person is saved (like Paul’s experience) or when one is emboldened in witnessing for Christ (like Peter‘s example). The baptism of the Holy Spirit occurs only to those who are believers. If you are not a believer in Christ, then you are none of His (Romans 8:9). You can’t even understand the gospel without the Holy Spirit (John 14:17, Romans 8:7) because “The man without the Spirit does not accept the things that come from the Spirit of God, for they are foolishness to him, and he cannot understand them, because they are spiritually discerned” (1 Corinthians 2:14). I pray you will put your trust in Jesus Christ today if you have not already done so. Then you can be filled with the Spirit, sealed with the Spirit (Ephesians 1), and be born again to eternal life (John 3:3, 16). That is my great desire for you if you have not already done so. Wow Mr. Jansen. You are too kind. I would love to meet your pastor someday. I have already caught much heat on this on our Facebook page but that is to be expected my friend. I thank God that there are men of faith like you who are an encouragement…much like Barnabas was to Paul and others. Thank you sir. Its all in obedience, we all need to know that we are serving properly, so when He lays it on my heart, I respond! BTW, as you know when you take heat its only because His word is doing the work it was meant to do, and will not return to Him void! When the Spirit is tearing down walls in their life they tend to lash out at what they dont understand is happening. So when ya hear the feed back just know He is at work! Is it true that the king james version of the bible is the most accurate bible in the english language I read that all the other versions leave out a lot of important verses and have a completely different meaning in the same passages or verses? Thank you Daniil. I believe it is very accurate but it is not the only one that is very accurate. The essentials of the faith can be found in several different translations but no translation is completely perfect but the essential doctrines of salvation are clear enough. In my studies, I use the KJV, the New King James Version, the ESV, and others so that I can get a more complete picture of what I am studying. Does this help? Other versions may leave out somethings but no one is ever lost to hell fire just because they can get a perfect translation. Pastor I’m Just 13 yrs old and I had accepted Jesus a while ago and I’ve filled filled with the Holy Ghost a couple of times and I know that if you believe in your heart that Jesus is Lord then you’ll be saved, but then some people say that you need to be baptized in the water to become a part of Gods family and inherit salvation is that true? Hello Jean-Marc. A person is first regenerated by the Holy Spirit. This causes them to repent of their sinfulness. Then they confess their sins and apologize to God for their sin having been responsible for their being separated from a Holy God. Then a person puts their trust in Jesus Christ and He becomes their Lord and Savior. Then…after all of this, a person should get baptized for it symbolizes and makes a public profession of their old life, old man dying, their are symbolically buried with Christ and then come out of the water, a type of resurrection to eternal life. That person was saved BEFORE they were baptized though..but they still should be baptized though, even though baptism doesn’t save them. Eternal life comes from faith, a gift of God, not of our selves, like baptism, and it comes thru Christ alone, by grace alone, in faith alone…and then that saved person should be baptized. I look at it like this (and, of course, I may be wrong), we are baptized in/with the Spirit when we are saved. The ‘filling’ of the Spirit occurs anytime we fully surrender to Him and get ourselves out of the way. In other words, when we give control of our choices, thoughts, and actions over to the Holy Spirit we can then be ‘filled’ with His presence and power. Anyway, just my thoughts. A great article, Jack. I’m a little surprised that you’re getting flack about it. God bless you, brother. Correcting my sloppy grammar let me try this again: Thank you Joe so much my good friend. I guess I like to wear clothing with bull eye’s, or at least so I have been told. 🙂 Seriously though, I love the quote by Jeremy Hodges. It is spot on my brother. I remember getting “reamed” a few times when I answered after being asked if I had been baptized into, with, or had the baptism of the Holy Spirit (usually they just say the “Spirit”) and since I can’t answer yes to all three, I just usually say that “I was given the Holy Spirit” but it was not even my own decision! I do not believe that I can be any more filled up if I were a full tank of gas! You either have the Spirit or you don’t have Him. I don’t like how people use the “Spirit” as an inanimate object or something that you can get, be filled with or be baptized into…like some kind of experience or object…instead of Who He is, God the Holy Spirit. Can God really be less or more in us if He is in us at all? For example, I am the father at home and could my family be any more filled up with me or any less with me? Now, as for being led by or walking in the guidance of the Holy Spirit, now that something that is altogether different than what they refer to as being “baptized into, with, or by” the Holy Spirit. Thank you and i am grateful and happy that you say 100% agree. I hope that this letter will reach to you. I have never yet told anyone(even our Pastor, in our church leaders,friends and even my family)except you about my decision to be Baptize this coming June 25, 2013,Tuesday because it falls on my Birthday and i have also to ask permission from my work. Your the first person i inform because i want to listen some advice or any message regarding my Baptism. Its been awhile or years for me to decide because i am not ready yet. The very reason why i decide now because in our church for so many sunday’s i attend i feel i am not one of them, i am just a listener and going there for an attendance only. I want to share message or to preach if that the word. Before, i ask my Pastor when i can do some church activities he said i have to be Baptize first and its in the bible thats what he told me. So, Pastor Jack i want to hear from you whats is your comments or opinion about this. I know whatever will you say its still my desire and its coming from my heart. Thank you and GOD BLESS…. Amen Helen. I believe that baptism doesn’t save anyone, as you seem to know, but we are told to be baptized after we are saved and so this is an act of obedience. The pastor probably wants your committment and you being baptized shows this to him and the church. I think some churches require it for church membership which I disagree with for that’s nowhere in the Bible but I would do it anyway for its not a big deal if you do. Even though we are not required to be baptized to join a church I would do it anyway just to follow your local shepherd and also for the reason that you can then begin to dive into serving in different ministries of the church like children’s church, the nursery, Outreach (evangelism), etc. Thank you too for your more than kind words. There is something quite special about you Helen. You use the two examples of Paul and Peter but they both spoke in tongues. I agree the Holy Spirit is present and fills at the time of salvation but Peter was present in the upper room Pentecost was filled and spoke in tongues Acts 2:4 and only after the that was he embolden to preach with boldness. (Acts 1:8 But ye shall receive power, after that the Holy Ghost is come upon you: and ye shall be witnesses unto me both in Jerusalem, and in all Judaea, and in Samaria, and unto the uttermost part of the earth.) And Paul says I speak in tongues more than you all in 1 Corinthians 14:18. One last thing do you believe the 120 were saved prior to Pentecost and if so why did they need to be filled again if being baptized/filled with the Holy spirit is in the initial work of salvation. Just some observations and questions. I asked to be baptized in the holy spirit last night at our prayer meeting. I have been saved for years and have felt Gods presence in my life repeatedly. I felt the need to ask God to baptize me in the holy spirit as well last night due to the encouragement and statement made by our pastors wife. She has stated often that if you do not speak in tongues the holy spirit is not in you. Therefore you are not truly saved. I am so confused about this. Can you clarify for me so I can understand this all better. I love and serve God each and every day. Thank you for your input. Hello Scheerie and thank you for your visit here and your question. In all my work in seminary, even in my master’s work, I have never read anything or been taught anything that says that if you don’t speak in tongues you don’t have the Holy Spirit in you. That is totally in error. The pastor’s wife does not know the Bible. Anyone that has repented and placed their trust in Christ has the Holy Spirit in them. This teaching is not found in the Bible. Personally, if this pastor’s wife says this then she believes this and so must her husband, the pastor. If they believe this, I would find another church for it they are in error in this then they are in error in other places I am sure. Please don’t worry for if you have repented and trusted in Christ you have the Holy Spirit and are saved. This belief that if you don’t speak in tongues then you are not saved is outright false and what other things must they believe that are also false. I would find another church right away and one that teaches correct doctrine and straight from the Bible and a church that doesn’t elevate the gifts over the Giftgiver…and that is God Himself. 17 And these signs will follow those who believe: In My name they will cast out demons; they will speak with new tongues; 18 they[a] will take up serpents; and if they drink anything deadly, it will by no means hurt them; they will lay hands on the sick, and they will recover.” In less it is a conversions just prior to death, like the thief on the cross, if one truly believes from the heart of obedience, these signs will follow those who believe. Isaiah 28:11-13 11For with stammering lips and another tongue will he speak to this people. I am a Christian / Pentecostal lady that has received the “baptism of the Holy Spirit” at the age of 18 in a youth camp I attended every year since age 16. I agree that you don’t have to speak in tongues to be saved. Salvation is a gift from God to anyone who chooses to believe that Jesus Christ is Lord. That he died for our sins and rose again. So one has NOTHING to do with the other. Some people prefer not to have the evidence of the baptism of the Holy Ghost. … or want it or get it or what have you. Some don’t believe it exists. Some aren’t sure if they believe. Some are scared of it. But my question is, what is your opinion or what do you think is happening when a truly saved person does speak in tongues? Do you think it’s fake? The person is living and walking in the spirit. They display the works of the spirit. The pray, fast, read and study the bible. Are in constant communication with God. Love God. Love people. Attend services. Help people. Give tithes and offering. Everything the word of God commands. But they also speak in tongues. Do you think it’s fake then? And if you do think it’s fake, or emotionalism… do you think that they are NOT saved because they are “making it up” or “faking it”. Which would then grieve the Holy Spirit? What do you think it is when someone speaks in tongues? It’s just a curious question. Not, in any way, trying to start a battle. I’m very curious as to what people think is physically or spiritually happening when they speak in tongues. Thank you for your question. I would talk with your local pastor about this since you may not agree with what I think since the Greek word that is translated into the word “tongue” is “language” so the best use of the tongue or language that any Christian can ever use if for is to speak to others in love (1 Cor 13) and to proclaim Jesus Christ as Lord and seek those who are going to perish without Christ. I do believe many do fake this tongue experience and have talked to many who said just that but just because they fake it doesn’t mean that they are not saved. To grieve the Holy Spirit is to be sinning. If you read the context of what Paul wrote you will see he was talking about how sin can grieve the Holy Spirit and not misuse of the tongue. My next question is just something to think about. You don’t need to answer or you don’t even have to think about it, if you don’t want to. What if there WAS something more (like being baptised in the H.S. and speaking in tongues), WHAT IF?… Wouldn’t you want to know if it was real/true and effective in giving you more power? If there was a slight chance that speaking in tongues is actually something that does exist, would you want it? Maybe ask God to talk to you specifically about this area. And be open-minded. Ask Him (whole-heartedly) to reveal this to you. Whether it be real or not. You might be suprised at what happens. Hi, Jack! I wanted to share. Not sure how long you have been a Christian. I just hit my 2nd spiritual birthday. This is what I’m experiencing in these first two years as a disciple of Jesus Christ. I need to share my testimony with you soon. All I want to do is be with the Lord. To shut myself up with Him for hours. I am now allowing myself to be vulnerable before Him. I tell Him everything, and share my heart with Jesus and ask Him to share His with me. I am wanting to devour His Word. I have the mindset of just let me have You even if You never bless me again. I couldn’t pull myself off my knees today. I just wanted to be with God. It hasn’t always been like this. Before I was truly saved you couldn’t get me to pray. Wow Brandon…to me, this is concrete evidence that you are abiding in the Vine and this leaves me convinced that I will surely (and eagerly look for seeing) you in the Kingdom. Wow…what zeal, what love for the Lord’s presence and His Word. Could you help me understand Acts 8 it look like they accepted the message of Christ and were baptized in water, then Peter and John laid hands on them to receive the Holy Spirit. If they received the Holy Spirit when they accepted Christ and I believe they did. What did they get when Peter and John laid hands on them and by the way how did Simon know they received something? Thank you for your help. Thank you Mr. Brister. Do you mean these verses? ACTS 8:13-25 13 Then Simon himself also believed; and when he was baptized he continued with Philip, and was amazed, seeing the miracles and signs which were done. 14 Now when the apostles who were at Jerusalem heard that Samaria had received the word of God, they sent Peter and John to them, 15 who, when they had come down, prayed for them that they might receive the Holy Spirit. 16 For as yet He had fallen upon none of them. They had only been baptized in the name of the Lord Jesus. 17 Then they laid hands on them, and they received the Holy Spirit. 18 And when Simon saw that through the laying on of the apostles’ hands the Holy Spirit was given, he offered them money, 19 saying, “Give me this power also, that anyone on whom I lay hands may receive the Holy Spirit.” 20 But Peter said to him, “Your money perish with you, because you thought that the gift of God could be purchased with money! 21 You have neither part nor portion in this matter, for your heart is not right in the sight of God. 22 Repent therefore of this your wickedness, and pray God if perhaps the thought of your heart may be forgiven you. 23 For I see that you are poisoned by bitterness and bound by iniquity.” 24 Then Simon answered and said, “Pray to the Lord for me, that none of the things which you have spoken may come upon me.” 25 So when they had testified and preached the word of the Lord, they returned to Jerusalem, preaching the gospel in many villages of the Samaritans. They may have gotten Holy Spirit when they laid hands on them…because it only says that the Samaritans had received the Word (8:14) and it says they “when they (Peter and John) had come down, prayed for them that they might receive the Holy Spirit. 16 For as yet He had fallen upon none of them” showing they had not yet received the Holy Spirit so it was only “Then they laid hands on them, and they received the Holy Spirit” so they didn’t have the Holy Spirit till hands were laid upon them, even though they had received the word. Now, how did Simon know they received something? He wanted that power to impart the Holy Spirit. That’s what Simon wanted as you read ” when Simon saw that through the laying on of the apostles’ hands the Holy Spirit was given, he offered them money, 19 saying, “Give me this power also, that anyone on whom I lay hands may receive the Holy Spirit.” Simon only saw that they received the Holy Spirit by the testimony of Peter and John I guess. There is no mention of visible evidence of the Samaritans manifesting the Spirit’s presence. Is that your question sir? In Acts 5:8, “Then Philip went down to the city of Samaria, and preached Christ unto them.” He preached Christ, the Messiah, the Anointed One. In v12, “…they believed Philip preaching the things concerning the kingdom of God, and the name of Jesus Christ, they were baptized, both men and women.” They believed in the name of Jesus. In John 1:12, “…as many as received him, to them gave he power to become the sons of God, even to them that believe on his name.” They were believers. They believed Philip’s preaching concerning the kingdom of God. In v14, “…Samaria had received the word of God.” This is not talking about the Hebrew Bible or the New Testament (it wasn’t written, yet). In John 1:14, “…the Word was made flesh, and dwelt among us…” As in v12, they received Jesus the Christ, the Word of God made flesh. In v15, Peter and John “…prayed for them, that they might receive the Holy Ghost.” This was a second experience subsequent to salvation. In v16, “…he was fallen upon none of them: only they were baptized in the name of the Lord Jesus.” These were baptized believers that did not have the Holy Ghost. In v17, Peter and John “…laid they their hands on them, and they received the Holy Ghost.” This was one method of transferring the Holy Ghost between believers, but not the only method. In Acts 19:2, Paul asked the men in Ephesus, “Have ye received the Holy Ghost since ye believed?” In v3, “And he said unto them, Unto what then were ye baptized? And they said, Unto John’s baptism.” These twelve believers had been water baptized. In v6, “And when Paul had laid his hands upon them, the Holy Ghost came on them; and they spake with tongues, and prophesied.” This was a second experience subsequent to salvation. All of the disciples spoke in unknown tongues. The churches in Rome, Corinth, Galatia, Ephesus, Philippi, Colossae, Thessalonica, etc. all spoke in unknown tongues. Paul was writing to people who spoke in unknown tongues. In Genesis 11:7, God said, “…let us go down, and there confound their language, that they may not understand one another’s speech.” God took away that original pure language at the Tower of Babel. They were babbling to each other and could not understand one another. In Isaiah 28:11-12, Isaiah wrote, “…with stammering lips and another tongue will he speak to this people. To whom he said, This is the rest wherewith ye may cause the weary to rest; and this is the refreshing: yet they would not hear.” This was a prophecy that was fulfilled after Jesus’ death on the day of Pentecost when the believers received the Holy Ghost and started speaking in tongues. In Acts 2:4, “they were all filled with the Holy Ghost, and began to speak with other tongues, as the Spirit gave them utterance.” This was a second experience subsequent to salvation. In Zephaniah 3:9, he wrote that God would “…turn to the people a pure language, that they may all call upon the name of the LORD, to serve him with one consent.” This was that original pure language that was taken away at the Tower of Babel. In Mark 16:17, Jesus said that “…these signs shall follow them that believe; In my name … they shall speak with new tongues.” In 1 Corinthians 14 there are two types of tongues, the unknown tongue in v2 where, “…he that speaketh in an unknown tongue speaketh not unto men, but unto God: for no man understandeth him…” and the other tongues in v21, “…With men of other tongues and other lips will I speak unto this people…” Paul distinguished between the two types of tongues in the previous chapter 13:1, when he wrote, “Though I speak with the tongues of men and of angels…” The unknown tongue is a type of angelic language and not the language of any country in the world. Some say that this language has disappeared again, but God returned it and only he can take it away. He had Paul write a complete chapter in 1 Corinthians 14 to describe the proper usage of unknown tongues and other tongues, the new tongues that Jesus spoke about. Tongues is for today. In Luke 11:1, “…one of his disciples said unto him, Lord, teach us to pray…” He didn’t ask Jesus how to preach, how to heal the sick, how to raise the dead, or how to cleanse the lepers. He asked him to teach them how to pray. Jesus gave an example we call the Lord’s Prayer, but the true answer came in v13, “ If ye then, being evil, know how to give good gifts unto your children: how much more shall your heavenly Father give the Holy Spirit to them that ask him?” It is necessary for the believer to ask the Father to give them the Holy Spirit. Paul wrote in Romans 8:26 that “…we know not what we should pray for as we ought: but the Spirit itself maketh intercession for us with groanings which cannot be uttered.” We allow the Holy Spirit to pray through us. Paul also wrote in 1 Corinthians 14:15, that “I will pray with the spirit, and I will pray with the understanding also: I will sing with the spirit, and I will sing with the understanding also.” We can pray and sing in unknown tongues. Jude 1:20 says, “…building up yourselves on your most holy faith, praying in the Holy Ghost.” This is praying in unknown tongues or prophesying. In John 14:16-17, Jesus said he would “pray the Father, and he shall give you another Comforter, that he may abide with you for ever; even the Spirit of truth; whom the world cannot receive, because it seeth him not, neither knoweth him: but ye know him; for he dwelleth with you, and shall be in you.” The world cannot receive the Spirit; only believers can receive the Spirit. This was a second experience subsequent to salvation. There are three types of people: 1) non-believers, 2) believers, and 3) Spirit-filled believers. Jesus said that every believer has the Holy Spirit dwelling with them, but not manifested physically in them. This we must ask for. In 1 Corinthians 12:13, Paul wrote that “…by one Spirit are we all baptized into one body…” When we believe the Gospel of Jesus Christ, the Holy Spirit places us into the body of Christ. This is the only baptism that saves us. Notice that it is the Holy Spirit that is doing the baptism. In Matthew 3:11, John wrote that Jesus would “…baptize you with the Holy Ghost…” Notice that Jesus is doing the baptism. Jesus never water baptized anyone according to John 4:2, “Though Jesus himself baptized not, but his disciples.” Even John the Baptist wanted this Holy Ghost baptism from Jesus when he said in Matthew 3:14, “…I have need to be baptized of thee…” When did Jesus baptize anyone with the Holy Ghost? It started after his death on the day of Pentecost and continues until he comes back. In Luke 4:1 it says that Jesus was “…full of the Holy Ghost…” This is the first reference to being full of the Holy Ghost. The Holy Ghost was not leaving. In Acts 6:3, they chose “seven men of honest report, full of the Holy Ghost” to be deacons. If you don’t speak in unknown tongues, then ask Jesus to baptize you with the Holy Ghost. Or if you know someone that does, ask them to lay hands on you as you ask Jesus to baptize you. You will speak in unknown tongues. But why? Why do we need the Holy Ghost? Jesus said we would be witnesses for him in Acts 1:8, “…ye shall receive power, after that the Holy Ghost is come upon you: and ye shall be witnesses unto me both in Jerusalem, and in all Judaea, and in Samaria, and unto the uttermost part of the earth.” We are called to be witnesses. In Matthew 28:19, 20, Jesus said, “Go ye therefore, and teach all nations, baptizing them in the name of the Father, and of the Son, and of the Holy Ghost: teaching them to observe all things whatsoever I have commanded you.” But he also told the disciples in Luke 24:49, “…I send the promise of my Father upon you: but tarry ye in the city of Jerusalem, until ye be endued with power from on high.” And in Acts 1:4, 5, Jesus told them that “they should not depart from Jerusalem, but wait for the promise of the Father, which, saith he, ye have heard of me. For John truly baptized with water; but ye shall be baptized with the Holy Ghost not many days hence.” This was a second experience subsequent to salvation. In Acts 2:38, Peter told them to “…Repent, and be baptized every one of you in the name of Jesus Christ for the remission of sins, and ye shall receive the gift of the Holy Ghost.” Repentance and salvation first, then receive the gift of the Holy Ghost. This was a second experience subsequent to salvation. In my opinion, one needs to ask these five questions for each baptism. 2. Who is doing the baptism? 3. Into what are they being baptized? 4. Why are they being baptized? 5. What are the results of the baptism? All I want to do is be with the Lord in relationship. I have a growing love for His Word. I talk to Him about everything. Am I getting on the right track? I believe you are already on the right track brother. Your last comment shows me that with no doubt. Love your hunger for His Word and for Him in prayer. Wow. believe in order to fulfill the service all of us are called to do. The bottom line focus on Jesus two basic commandments and Holy Spirit will show up love God with everything and love others as you love God. Sorry forgot to add ultimate goal is to know our creator there by know our true nature before it was stollen by separation from God by one mans sin. First of all Brandon, please read this about Christian Dream interpretation at this link: http://www.whatchristianswanttoknow.com/christian-dream-interpretation-does-god-use-dreams-to-speak-to-us/ I do not know exactly what this dream means other than God may be trying to tell you that some in your family or someone you know at work or a friend. may not be saved. Daniel and Joseph could interpret dreams but they had direct revelation from God. I do not. There is no gift of interpretation of dreams that I know of. I would also talk to your pastor about this but God does sometimes use dreams to send us a message and in this case, to make warn those in your family, friend, co-workers that they must be saved. Read 1 John 3 and see if they are a believer or not because 1 John 3 shows how a believer lives. I hope this helps and you get peace from God about this dream. Jack, I will do that. Thanks! I have asked God to show me the meaning. He will in His perfect timing. I do know that God’s Word says that there are false Prophets and false EVANGELISTS. Wonder if it had anything to do with later that morning. I went out yesterday to ASU preaching the gospel. I witnessed to about 6 people. God moved on the heart of a young woman who was in tears, because nobody would listen to her problems, but I sat down, gave her the law/gospel, listened to her pour her heart out, took her by the hands and prayed for her. I love seeing God move! I am so blessed by your obedience to the Great Commission Brandon. You are storing up crowns in heaven for this labor of love for God! Wished I could join you there in the harvest field of souls. Amen brother Jack! I wish I were back out there now! And I enjoyed meeting people. I just long to see a REAL move of God. For revival. To see His Beauty/Glory truly at work. I am wanting to work up to open air preaching. To make Christ known out loud. John the Baptist, Paul, the Apostles, Jesus, and Jeremiah PUBLICLY proclaimed the judgment to come. I even had a dream months ago where I was standing before a large crowd preparing to read John 1:1-5 and proclaim the gospel in open air but my fingers couldn’t find the verses! Lol! I then woke up. How do I block or unsubscribe from your email? Mr. Perry…can you not block emails on your email account? For example, my email on Outlook has an option of “Block Email From.” Otherwise, I can delete your 3 comments and that might do it. I will do whatever you say sir. Please pray for me as I am entering another phase of lack of assurance of salvation. I just want to be free from this and grow. I want peace. I will Brandon. Please believe that you are loved brother and if by me, a fallen creature who is highly imperfect, how much more does God!? I would suggest you read John chapter 6 & 10. There is real power in that Gospel of John and those chapters in particular and then maybe it will help you my beloved brother in Christ. Thank you brother Jack. As long as Jesus knows me when I stand before Him. I desire Him for eternity. The true acceptance as sons and daughters of God is through the baptism of the Holy Spirit. This baptism can only come through Jesus, for he is the baptizer by fire. He is the one who baptizes those who are destined to be God’s children. God promises through Joel 2:28 that in the end times he will pour out his spirit upon all flesh, and your sons and daughters will prophesy, your old men will dream dreams. 28 “And afterward, I will pour out my Spirit on all people. Your sons and daughters will prophesy, your old men will dream dreams, your young men will see visions. Everyone who is fully committed to be a Christian must be baptized in water for repentance. It is repentance before acceptance. So there will be no exception to this rule. Jesus himself was baptised by John. When we get baptized in water, we are being born again by water, and when we get baptized by Jesus in the Holy Spirit, we will be born again in the Spirit. So we need to be baptised in water and spirit else we are not born again. We cannot enter into the kingdom of God if we do not follow the specific instructions of Jesus. He himself did what he preaches to show the way. Those who are baptized in water but not baptized in the Spirit could not understand the scriptures since it remains closed to them. Without the Holy Spirit revelation of what scriptures mean, they could not understand its meaning. Thus, they can only use their own human intellect to get understanding, which leads to many untold perversion of the Gospel of Christ. The key to the gateway of the kingdom of God is through Jesus. He is the way, the truth and the life. Many are baptized in water but few are given the Holy Spirit by God because they were never granted or qualify as sons or daughters. They simply worship in vain seeking wealth and prosperity but not the will of God in their lives. So these people are not born again, they have no revelation as the Spirit is not their teacher; they worship with rules taught by men. Men who themselves do not possess the Holy Spirit which is of God. Without the Holy Spirit of God they will never know the will of God in their lives, for God was never their Father. Who gets the Holy Spirit? It is Jesus who justifies as he was the one who died for the remissions of our sins. So he is the way to the kingdom of God, no one comes to the father but through him and him alone decides. There are many great teachers, who teach about the Holy Spirit, but they have never encountered him nor do they know him. When you have the Holy Spirit you will begin to hear the voice of God. The Key to the Kingdom of God is the Holy Spirit. It is Jesus who is the only gate for those whom he acknowledges as his sheep. One special characteristic of his sheep is that they hear his voice. Those who are baptized in the Holy Spirit will hear the voice of God and they will obey and follow him. They bear the fruit of good works. Good works which were ordained for them to perform in the power of the Holy Spirit. This will be the same for all his believers and followers like master like slaves or disciples. These good works are not man made or programmed they are moved by the Holy Spirit in them to do those good works that glorify God. If you have not been baptized in the Holy Spirit, what I write will make no sense to you. However, I have to write this so that you may know if you have the Holy Spirit in you. If not than seek, ask and knock until the Jesus gives it to you, else you will not enter into the kingdom of God. That is why the way is very narrow. Doing good works is not salvation through works; these good works are the fruits of your salvation. All Holy Spirit filled believers will progress to good works which have been ordained by God for them to accomplish on earth, just like what Jesus did, he was baptised in the Holy Spirit and went about doing good works. The proof of being Spirit filled is the good works done. No fruit no inheritance and those trees that do not bear fruit will be cut down by Jesus himself. This is the narrow way; it’s his way, no point to argue with God. We need to accept the terms and conditions of our salvation after all it is Jesus who paid the price and he will decide not men or preachers with wrong understanding. No one can change the mind of God by pleading with him, no one. Read your bible carefully, your eternal salvation depends on getting the truth. God promises to give the Holy Spirit to those who asked and seek him earnestly. Many thought that Ask Seek and Knock is for anything, it is only for the Holy Spirit that Jesus mentioned ask seek and knock, persevere until the Father send you the Holy Spirit. The Holy Spirit is the only guarantee that you will receive salvation unto eternal life. There is no other guarantee. The baptism of the Holy Spirit is a tangible experience, you will feel power coming into your body and heat or warm is the usual encounter with the Holy One. Let no men deceive you of this. Once you have received the Holy Spirit, it will teach you all truths. You will not be confused by all the false doctrines or good intentions of many misguided teachers of the bible as the anointing shall guide you into all truths. All the supernatural acts of God will become real to you once you have the Holy Spirit in you. Only when you have the Holy Spirit will you enter into the kingdom of God and understand what it is. The Supernatural kingdom of God is real. Without this anointing by the Holy Spirit, you will be forever learning never understanding. You will be blind and deaf, forever hearing never understanding what God is trying to say to you. The key into the Kingdom of God is the baptism in the Holy Spirit. When you are baptised in the Spirit you will receive the gift of the Spirit. Without the Holy Spirit, we cannot overcome sin. Without the Holy Spirit, men cannot hear from God. Men have no power over sin; only through the Holy Spirit can they overcome sin. But the Holy Spirit will convict us of sin and he will cause us to bear fruit and move us from glory to glory throughout our Christian life. So we will develop the fruit when we have the Spirit in us. This is called the sanctification of the Holy Spirit. Please make sure you get the Holy Spirit and not some other spirit. Only when you bear the fruit of the Spirit then there will be no law against you. Meaning the law of sin cannot touch you since you are now in Christ, the Holy Spirit of God. That is the true salvation works of Jesus Christ. He grants us the gift of life through grace. So those Christians who think they can still sin and be in Christ are deluded. The Holy Spirit will sanctify us through the purging of sins in our lives eventually depending on our willingness to give that sin up for him to burn the dross from our lives. We have to decide to give it up, without our commitment the sin will remain like a stain embedded into our soul for all eternity. We cannot get rid of the sin ourselves; it is the Holy Spirit’s job to cleanse us of this sin. No Holy Spirit means; no salvation nor righteousness. You cannot bear the fruit of the Spirit without the baptism of the Holy Spirit by Jesus Christ. When you get baptised in water, the baptism of the Holy Spirit is not automatically included. It is not, so you need to seek it earnestly. This is truth, read your bible. 18 A good tree cannot bear bad fruit, and a bad tree cannot bear good fruit. 19 Every tree that does not bear good fruit is cut down and thrown into the fire. The above is truth, it is written in the bible and no man can change what Jesus said himself. If any man adds or subtract than he will be have curses and lose his salvation. That is why the way is a narrow one, without the Holy Spirit no one is guaranteed salvation; no one. The righteousness that comes from Jesus through grace is the Holy Spirit as only the Spirit of God is righteous. Those with the Holy Spirit are considered righteous and they all wear this white robe. 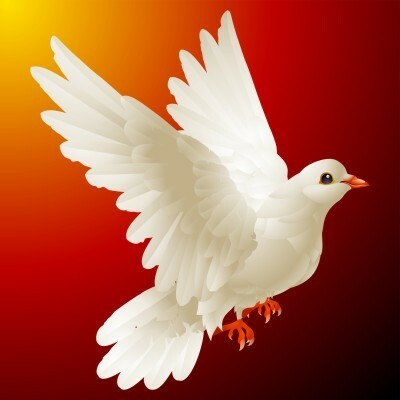 The Holy Spirit is not a dove; it is this white robe, the robe of righteousness as mentioned by Isaiah. Without the Holy Spirit, you will not be considered righteous by God and you will not have your salvation guaranteed. Let no one deceive you on this matter, its life or death. The garment of salvation is the robe of righteousness which is the Holy Spirit of God. The scripture speaking of being baptized “by” the Holy Spirit or “with” the Holy Spirit is referring to the same experience: Holy Spirit immersion into Christ. In the original greek language, both words are εν (en), which has the most common translation of “in” but may also be translated as “by” or “with”. There is more that needs to be considered on the topic of Holy Spirit Baptism. Can someone help me please I was baptized while in high school and lived a life of sin I’ve tried living right to please God but failed now I’m 30 and I looked back at my life and ashamed I’ve asked god for forgiveness and repented but I realized that I knew very little about god I barely picked up the bible yet I kept it with me everywhere I went into now have a burning desire to serve him to the fullest so where does this place me n did I ever have the holy spirit to begin with? And how if I never knew about it or what it does? Hello John. I would schedule a meeting with your pastor about this. If you have this desire to serve God, then a local church can certainly use you. That will give you a holy pleasure that you’ve probably never felt yet. If a person has repented of their sins, which means they’ve turned away from their sins, which is a work of God, and then puts their trust in Christ, they will be saved, no matter how they feel. It’s good to be certain now, before the Lord returns. I would speak with your pastor, but also get into the Word of God every day so the Word of God can get into you. This was helpful for me, but I have a quick question. So I was saved the moment I believed in Jesus as my savior, right? Nothing I can do to lose that? You see, I gave myself to him at a young age, before I would have even understood the truth of rebirth and heaven/hell. Was I saved because I trusted in him, even without the clear details? You see, I continued to sin after I was saved. All believers do, but it made me question if I was saved or if I had just sold my salvation and could never get it back. That was the depth of my sin, the fear of my condemnation. And I know that if I was saved, I always will be. I know that if I was not, then it’s probably too late for my soul. Due to my continuation in a sinful lifestyle. I just wonder if I was saved, even though I was not baptized until recently. Or if I am saved. Because I still believe in Jesus and his mercy. Did I mess it up? Lose my salvation, even though I still believe, turn from and hate sin. Hello Stephen. The verse you quoted is not good enough by itself to build a belief system on. This is one of the Bible’s most difficult passages to interpret, but one thing is clear—it does not teach that we can lose our salvation. There are two valid ways of looking at these verses. One interpretation holds that this passage is written not about Christians but about unbelievers who are convinced of the basic truths of the gospel but who have not placed their faith in Jesus Christ as Savior. They are intellectually persuaded but spiritually uncommitted. Have you ever spoken with your pastor about this, if I haven’t asked already? Baptism doesn’t saved but the saved should be baptized. Any person that is worried about losing their salvation probably hasn’t. Everyone who repents of their sins, even if it starts today, and then puts their trust in Christ, will be saved. I don’t believe we can lose what we did not gain in the first place (John 3:16). This website is wonderful. But I would like to how you interpret the scripture, Acts 19:1-6, in which Paul asks a group of believers, “Have you received the Holy Spirit, since you believed?” Then he prays for them, and “they were filled with the Holy Spirit, and began speaking with other tongues”. They were obviously already believers before he prayed. Great question Cynthia. They were not really believers but only disciples of John the Baptist (Acts 19:3-4), so it was not that they believed because they had not yet known they must trust in Jesus Christ and so disciples of John are not the same thing as believers. I hope this helped. Yes, they already believed, but they believed in the baptism of John alone. That was not enough.